A recent patent filed on behalf of Apple has made its way to the US Patents website, which details the development of a new camera stabilization mechanism. The "VCM OIS actuator module" is not only poised to reduce image blurriness, but will also allegedly improve autofocus speed. Through the use of voice coil motor (VCM) actuators that move the camera in directions that move the lens in orthogonal directions related to the optical axis, the new VCM OIS system is designed to compensate for hand movement when taking a photo or video. 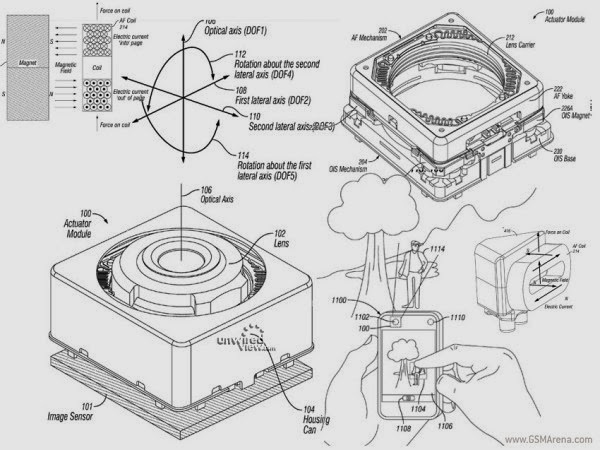 Better yet, the design also has the lens and image sensor attached to one another as one rigid body, which should result in substantially simplified camera manufacturing process. Heretofore Apple has yet to join the arms race that has been camera megapixels, relying instead on pixel size to make its 8MP shooter stand up against the 13MP (and higher) sensors found on most competing flagships. While initially this was enough, our recent six-way camera phone shootout saw it fall behind in image fidelity of its higher-resolution rivals. Hopefully, the new mechanical OIS tech will help it make up for lost ground and we'll see a better camera than ever with the next iPhone - whenever that is.